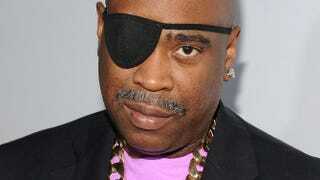 Old-school rapper—and longtime Bronx, N.Y., resident—Slick Rick became an American citizen Friday after many years fighting deportation, reports the New York Daily News. Born Ricky Walters in the United Kingdom, Rick came into fame in the 1980s with the iconic hip-hop classic, “La-Di-Da-Di” (later redone by Snoop Dogg) as part of Doug E. Fresh’s Get Fresh Crew. “I am so proud of this moment—and so honored to finally become an American citizen,” said the rapper in a statement. The icon with the eye patch had been battling for years against immigration after he was jailed in 1991 for two counts of attempted murder. He spent five years in prison. Although he always maintained that he was acting in self-defense, officials sought to deport him because he was a citizen of another nation convicted of a violent crime. The News reports that Walters was almost deported in 2002 when he was detained in Florida after coming back into the country from a Caribbean concert cruise with singer Erykah Badu. Though he spent time in a detention center, he was eventually released. In 2008 the African-American governor of New York, David A. Paterson, pardoned Walters unconditionally, clearing the way for his citizenship.